How to access the power and profitability of pro bono resources? Savvy nonprofits use strategic management, marketing, technology, leadership to be competitive. With strapped budgets, many nonprofits cannot afford to pay for these resources. However, businesses are an often overlooked as an effective source of skilled professionals who can supply the needed skills. 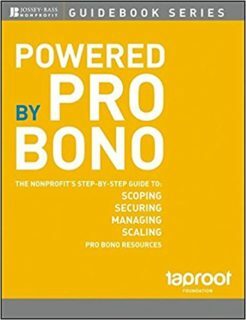 This book shares the acclaimed Taproot Foundation?s pro bono best practices and shows nonprofit managers to apply them to their own unique challenges in a low-to-no-cost way. The author offers keys to identifying opportunities for using pro bono sources, recruiting pro bono resources, and managing pro bono projects effectively.